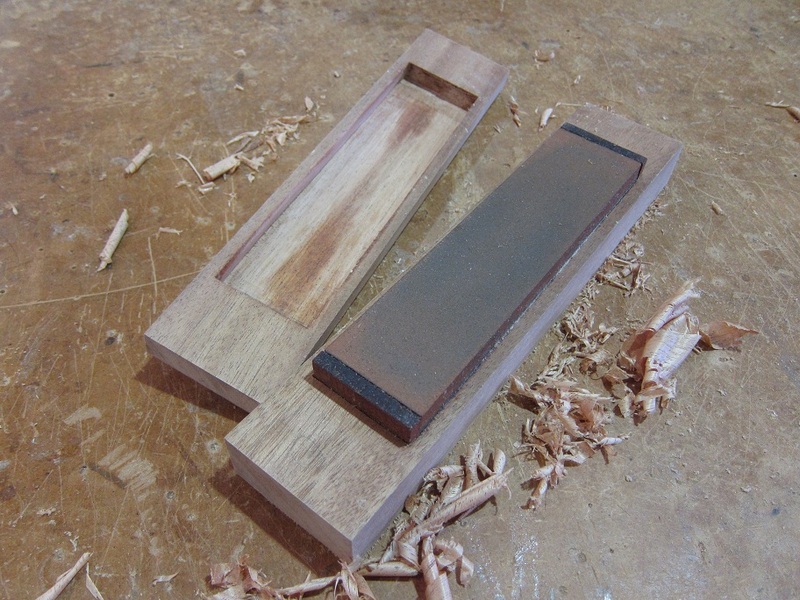 In order to produce good quality woodwork, chisels and planes need to be sharpened several times a day, so an oilstone is an essential piece of kit. My mission for last week was to make a safe home for mine. This is a bit of a rite of passage for joinery apprentices. There must be loads of sheds and garages around the country which have an oilstone box made by fathers or grandfathers, stained with oil and years of service (the oilstone box that is, not the fathers and grandfathers). So, starting with two lumps of sapele, I squared them up, hollowed them out, carved a fancy pyramidal shape on the lid and then applied several coats of varnish. Sounds easy, but it took four days. I’m three coats of varnish in now, so my box is nearly done. My oilstone can hardly wait. Unfortunately, that wasn’t the only product of last week’ work. After spending hours on end chiselling out an oilstone shaped hole in a block of wood, I found that it was quite difficult to stand up again. I staggered to afternoon tea-break like Matthias in the Life of Brian. My legs are grey. My ears are gnarled. My eyes are old and bent. New thing number three last week was a session with the in-house yoga teacher; which couldn’t have been more timely. The exercises were a godsend, and also got me thinking about posture and that sort of thing; after all, swapping the ability to be vertical on demand for the ability to build boats would be a sacrifice too far. A block of wood under each leg of my workbench seemed to do the trick. The bench is now high enough that I don’t need to bend over to work at it, and I can stand up again. Who said workstation assessments were a waste of time. Time for another coat of varnish. This entry was posted in Joinery and tagged Life of Brian, oilstone, workstation assessment, yoga by philiplane. Bookmark the permalink. I continue to be in awe of the intricate details involved in this endeavour. Who knew that it would be so involved? I guess that doing something *right* involves putting much attention into every little detail at every single stage, whether it’s boats or something else.